In today’s world, social media makes it convenient to become invested in other people’s relationships and compare yourself to them. It is easy to start to panic when every day you open your Instagram account and you see a new engagement announcement. Feelings of discomfort, sadness, or anxiety may arise. You may start to ask yourself, “Why am I not there yet?” or think, “I should have found the one for me,” or, “I thought I would be married by now.” It is hard to not be consumed in comparing where you are in your life to where others are. However, when you begin to focus too much on what others are doing, you lose sight of your goals and your dreams. Marriage is a beautiful aspect of life that many people want to experience, but is it necessarily your next step in your life? Are you feeling pressure to get married just because it seems like you should be? Have you taken the time to explore and love yourself? 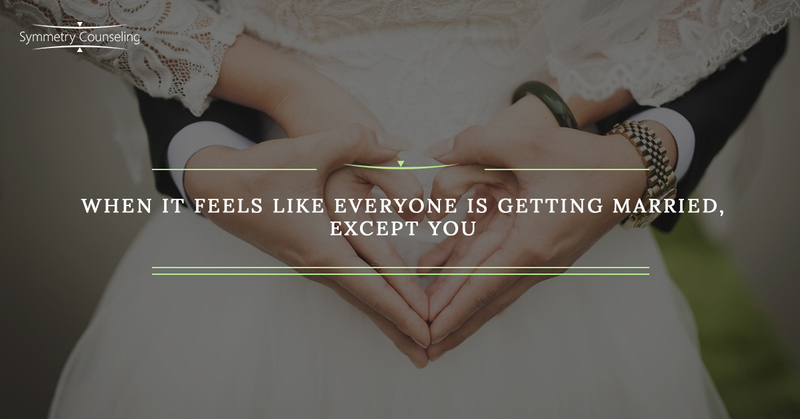 Here are some things to consider when you feel like everyone is getting married except you. 1. Marriage Doesn’t Define You. Marriage is a huge change in a person’s life, but it does not validate your being, officially make you an adult, or make all your problems go away. Marriage is work, and it is important to consider if it is something you want. When you begin to feel anxious, stop comparing, and reflect on how you can make your own life more meaningful in the present. Take some time to create a life plan based on your dreams, and remember, there is no deadline to living a happy and enriched life. 2. Focus On Your Accomplishments and Goals. Focus on the things in your life you are proud of and what you have already accomplished. Take out a piece of paper and make a list your biggest accomplishments. After you have written those down, make another list of your future goals you would like to accomplish. Take this time in your life to work towards those goals and engaging with those who love you. Set your own bar, and live by your own standards. 3. Love Yourself. By exploring, respecting, and accepting yourself, you begin to love yourself and live for what makes you happy. Explore new things in your life that make you happy, respect and validate your own values and beliefs, and accept that you are not perfect. Loving yourself will eventually lead to less comparing, greater self-acceptance, and more happiness. If you are feeling like you keep comparing your life to others and would like the support and skills to learn to respect and accept your imperfect but lovable self, it may be useful to connect with a therapist. Contact Symmetry Counseling to set up an appointment with one of our highly skilled therapists at one of our two Chicago locations.